(Jakarta, July 8th 2014) – Testament to the ongoing success of Indonesia's largest hotel management group, Archipelago International have recently celebrated two milestones of their newest brand, Harper, with the topping off ceremony for Harper Perintis Makassar and the ground breaking of Harper Pasteur Bandung. The topping off ceremony for Harper Perintis Makassar took place on June 8th 2014, which also saw the launch of Manggala Junction; a lifestyle mall with an integrated food village. Located in Jalan Perintis, Harper Perintis Makassar is conveniently close to the airport and the noteworthy government district. The hotel will feature 159 rooms and suites and will be suitable for both business and leisure travelers. Within the hotel there will be a signature coffee shop, a lounge and bar, a swimming pool, as well as 5 meeting rooms and an expansive ballroom for up to 1100 guests. 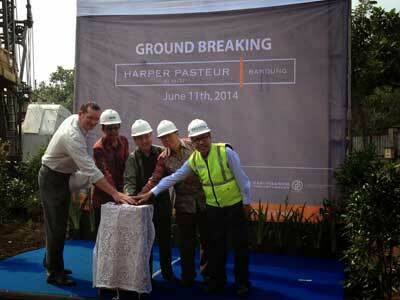 Following the topping off ceremony, June 11th 2014 saw the Ground Breaking of the much anticipated Harper Pasteur Bandung, slated for opening in early 2015. 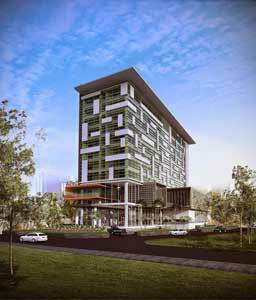 The hotel will be the first Harper brand to hit Bandung, set to bring a new nuance to the city's accommodation options. The 170 room hotel will feature a coffee shop, a lounge and bar, a swimming pool and 10 meeting rooms, and it will be located close to the Pasteur toll road for convenient travel, whilst also being close to the Bandung Trade Center and Hyper Point. Harper hotels are conceptualized as modern accommodations, topped off with an infusion of rustic charm and a residential feel. Combining comfort and functionality, Harper’s design concept uses warm, rich colors to offer comfort in every room. Accents of warm autumnal fabrics and soft orange hues promote relaxation with spiced pumpkin, tangerine and amber, while modern grays create an understated cool elegance. “We are extremely proud to be celebrating these two milestones for our youngest brand, Harper, which continues to add significant achievements to its ongoing success story. Ever since the first opening of Harper Kuta in Bali in 2013, the brand has gone from strength to strength, so these two new properties in Makassar and Bandung will make great additions to our hotel’s collection. We are also ready to open the second Harper in Yogyakarta, for which you can follow its development at our website www.HarperHotels.com” says Norbert Vas, Archipelago International's VP Sales & Marketing.